I guess Kieffer has graduated from the reefer! Jenelle Evans‘ notorious ex Kieffer Delp (who ironically was accused of being the secret father of Ensley) was just arrested for running a meth lab. On Wednesday evening Kieffer was arrested near Pittsburgh, PA after authorities responded to a tip about a suspected meth lab in the basement apartment where Kieffer was living. There had been multiple complaints about the lab and police had been investigating for weeks before finally nabbing Kieffer! While I highly doubt Jenelle Evans will win Reality Tea’s favorite Teen Mom 2 star poll, I have to give credit where credit is due. Jenelle appears to be happy and healthy since the birth of her second son, Kaiser, and seems to be well on her way of regaining custody of Jace. These days, the Teen Mom 2 star’s social media accounts are packed full of pictures of fun times with her family. I certainly don’t think her life is drama free – because, Jenelle – but these pics are a far cry from the looking like homeless people living in our car selfies Jenelle used to post when she was with Useless Thing 1, Kieffer Delp, and Useless Thing 2, Courtland Rogers. See pictures of Jenelle, Barbara Evans, Jace, Nathan Griffith, Kaiser, and Nathan’s little girl Emery celebrating Christmas below. Is Jenelle Evans’ Ex Sneaking Into Jace’s Day Care To See His Son? 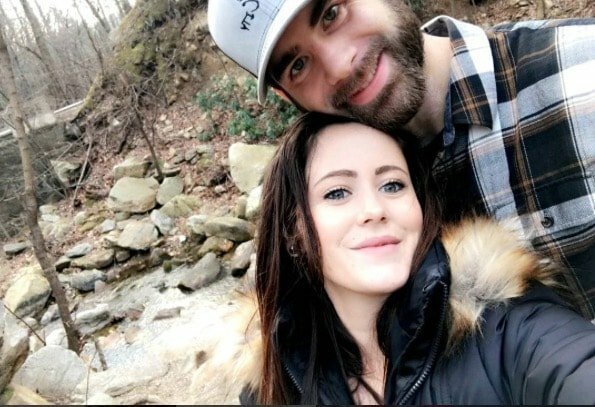 You can't say that Teen Mom 2's Jenelle Evans doesn't have a type when it comes to the guys she "dates"! Unfortunately for her (and mainly son Jace), that type tends to be loser convicts. Jenelle and her past lovers/husbands/fiances/ baby daddies could fill a photo album with their mug shots, and Jenelle would have a few gems in there herself! As Jenelle waits to divorce her incarcerated husband Courtland Rogers so she can marry the recently arrested Nathan Griffith who is the father of her unborn child (while feuding with heroine chic homeless ex Kieffer Delp), there is one dude we never hear about–Jace's actual father (although I hate to use the term father, as he's never acted like one). Well, now Andrew Lewis is back in the picture! Jenelle Evans Feuds With Kieffer; Admits She’s With Nathan Griffith For Baby! There is literally never a dull (or responsible) day in Jenelle Evans' life. While Nathan Griffith was in jail last week, a bored Jenelle sought out trouble by feuding with ex, Kieffer 'The Reefer' Delp! The Teen Mom 2 star's exchange with Keiffer became so heated she called him the N-word but Jenelle then admitted she is only staying with Nathan for the baby. Oh heavens. Radar Online was able to snag the conversation, which was conducted via Facebook messenger. I'm not sure how it started, but Jenelle initially sang Nathan praises before ripping into Kieffer. “Let’s see…Personal trainer, football player, college student, completed his 4 year term in the marines, was deployed twice I think but def once, graduated high school from a private school, comes from a great family,” she wrote.